Wendy Leeds-Hurwitz, the Director of the Center for Intercultural Dialogue, manages this website. “The EU has long been encouraging an exchange of ideas across its borders, hoping to engage young people in European affairs. A prime example is the European Youth Parliament – a platform for intercultural dialogue on hot political issues in the EU. It met recently in Lillehammer in Norway and we caught up with some of the young members taking part in the debate. For more information, see the original article posted on Euronews. Shiv Ganesh is Professor of Communication at the University of Texas, Austin. Shiv’s research engages with substantive issues that arise from the intersection of communication processes with globalization, digital technologies sand civil society organizing. Specific studies he has published include such topics as technological transformations in collective action and social justice, dialogue and social change, volunteering and nonprofit organizing, global aspects of the digital divide, and neoliberalism and entrepreneurship, and global rhetoric about technology. Shiv’s current Marsden-funded project, which began in 2013, builds on his research agenda by tracing how emerging and established forms of social justice organising in Aotearoa New Zealand intersect in volatile technological environments. 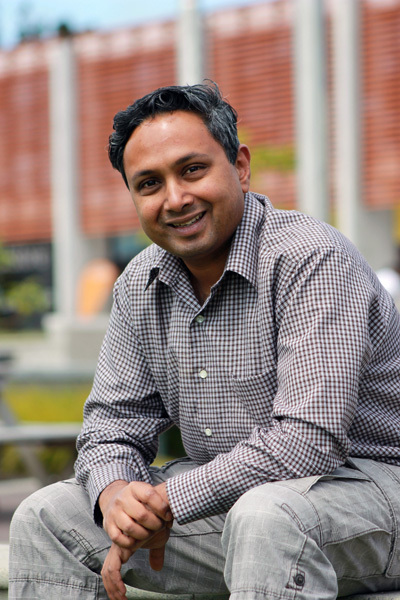 Shiv’s research and writing has also won numerous awards. He recently won an Article of the Year Award from the National Communication Association in the USA, the world’s largest body of communication researchers, for outstanding contributions to Public Relations Theory, for his monograph in Communication Theory, co-authored with Heather Zoller and titled “Dialogue, activism and democratic social change.” In 2012 he was also the recipient of the prestigious Frederic Jablin Award for Outstanding Contributions to the field of Organizational Communication, awarded by the International Communication Association in May 2012. He also held a Marsden Foundation grant to investigate global social justice organising in Aotearoa New Zealand from 2007-2009, and a paper published from that grant in the journal Communication Monographs won the 2011 outstanding article of the year award from the International and Intercultural Communication Division of the National Communication Association. He has also received top paper awards in 2010 and 2011 from the International Communication Association as well as the National Communication Association for papers on global aspects of the digital divide as well as the rhetoric of climate change denial. In 2010, his book, co-authored with George Cheney, Lars Christensen and Ted Zorn, titled “Organisational Communication in an Age of Globalisation” won the top textbook award from the Organisational Communication Division at the National Communication Association. Until August 2013 Shiv was editor-in-chief of the National Communication Association’s Journal of International and Intercultural Communication, and is on the editorial board of several top Communication and Management journals, including Communication Monographs, Journal of Communication, Human Relations, Management Communication Quarterly, Journal of Intercultural Communication Research, and Organization. While now primarily in an administrative role as Head of School, Shiv continues to maintain an active research profile, both in New Zealand and abroad. He recently delivered the keynote address at the VIIIth Congress of Organizational Communication and Public Research in Londrina, Brazil, and earlier in 2014 delivered the annual Corus Entertainment Distinguished Lecture at MacEwan University in Edmonton, Canada. The aim of this blind, peer-reviewed section of Liminalities is to explore performance and performativity in urban environments. The editor anticipates (at least) the following types of submissions: theoretical essays; ethnographic projects; audio, photographic, video, and web-based projects (or any mix thereof) about urban life and cities; and book reviews. Iris I. Varner is Professor Emeritus for International Business at Illinois State University where she was a professor and the Director of the International Business Institute. Varner is a past President of the Association for Business Communication (ABC). She has won the ABC’s Outstanding Teaching Award and was named Fellow of ABC, and Distinguished Member of ABC. She received several departmental research and teaching awards. She is a native of Germany. She earned the Staatsexamen at the Albert-Ludwigs-Universitaet in Freiburg, Germany. She received her Ph.D., an M.A. in German literature and an MBA from Oklahoma University. Varner’s research interests focus on the interaction between business management, culture, and communication. Varner is co-author of the book, Intercultural Communication in the Global Workplace. Varner has done research on expatriation, cultural adjustments for successful expatriation, and criteria determining expatriate success. She has also examined the composition of corporate boards in Asia, Europe and North America, focusing on gender representation and international preparedness. Varner is an adjunct professor at the University of Lugano, Switzerland and a visiting professor at the University of Dresden, Germany. In addition, she has given lectures and seminars in New Zealand, Hong Kong, China, Japan, Belgium, France, Russia, and Poland. She serves on the editorial board for the Journal of Business Communication, and the Business Communication Quarterly. FLORIDA ATLANTIC UNIVERSITY, School of Communication and Multimedia Studies, is seeking an Assistant Professor (tenure-track) and two full-time Instructors in Communication and Civic Discourse. The School’s undergraduate and graduate degrees in Communication Studies emphasize contemporary cultural concerns while situating these within the broader historical context of communication and cultural theory. Candidates will be able to teach courses in rhetoric, communication, and cultural discourse with an investment in both local and global issues and communities. Areas of expertise might include communication and citizenship, public address and deliberation, identity and ethnicity, and media, technology, and the public sphere. Effective date of employment: August 2011. Ph.D. and teaching experience required, as well as demonstrated potential for research and publication. Application deadline: March 18, 2011. Application must be made through FAU’s employment site. Position numbers: 980724, 992250 and 980928. Attach letter of application, CV, samples of scholarly work, and three reference letters to your on-line application. Confidential letters of recommendation can be sent by standard mail to: Eric Freedman, Associate Director, School of Communication and Multimedia Studies, Florida Atlantic University, 777 Glades Road, Boca Raton, FL, 33431. E-mail for inquiries only: efreedma@fau.edu. For detailed information on FAU, visit our web site at: http://www.fau.edu/scms. A background check is required for the person selected for this position. Florida Atlantic University is an Equal Opportunity/Equal Access Institution. Saskia Witteborn (PhD, University of Washington, 2005) is Associate Professor in the School of Journalism and Communication at Chinese University of Hong Kong where she also directs the M.A. program in Global Communication. She is Associate Editor of the Journal of International and Intercultural Communication, past Chair of the Communication as Social Construction Division at NCA, and Research Associate of the University of Washington Center for Local Strategies Research (in affiliation with the United Nations Institute for Disarmament and Peace in Geneva). Her research focuses on communicative practice and migration and how migrants create, adapt to, and enact ways of communicating and grouping in new sociocultural and political contexts (face-to-face and mediated). Moreover, her research explores how communication practices are constitutive of and constituted by transnational political, economic, and cultural processes and strategic interests. Saskia works mostly from an ethnographic and language and social interaction perspective and tries to understand how transnational migrants themselves perceive and create their sociopolitical and cultural realities. She has published on collective identity enactment by people with a migration background from Arab countries in the U.S., on social spaces, communication, and forced migration in Europe, on political advocacy by migrants from China in the U.S. and Germany as well as on Global Citizenship and Intercultural Dialogue in such journals as the Journal of Communication, Research on Language and Social Interaction, the Journal of International and Intercultural Communication, and Language and Intercultural Communication. A chapter on political advocacy and gender is published in Circuits of Visibility: Gender and Transnational Media Cultures (Ed., R. Hegde, NYU Press) and a chapter on forced migrants and new media practices is forthcoming in the Handbook of Global Media Research (Ed., I. Volkmer, Routledge). Go to her website for further information and contact details. The Media Program at the American University of Beirut is delighted to host the 16th annual international conference of the Arab-US Association of Communication Educators (AUSACE), October 28-31, 2011. This year’s Conference theme is Digital and Media Literacy: New Directions. Mobile phones, blogs, online social networks, wikis, user-generated news, and a plethora of ubiquitous digital media have facilitated access to information; allowed people from around the globe to connect; offered enormous potential for communication about, from, and among civil society groups, democracy advocates, and political activists; and presented new possibilities for national development projects and political change. But the potential of digital media diffusion cannot be realized if people lack the ability to access, analyze, evaluate, and create media content. Increasingly, digital literacy and media literacy are viewed as agents for the acquisition of such skills and knowledge, and as essential components for all levels of education and every member of society. Integrating digital and media literacy into educational curricula and public agendas will help ensure citizens, groups, and institutions are equipped with the essential analytical and communications skills required for success in the 21st century. AUSACE 2011 conference participants are encouraged to interpret this year’s theme broadly to include new directions for media education, for national development, for democracy, for civil society, and for global engagement. Topics relating to the current events in the Arab world are especially encouraged. Abstract submissions for research papers, panels, and poster presentations are now open. For details on how to submit please visit the official conference website. AUSACE is an organization dedicated to the advancement of Arab-U.S. relations among communication educators and media professionals. AUSACE conferences bring together communication scholars from all around the world to discuss local, national and global issues related to the field. The 20th World Business Congress of the International Management Development Association (IMDA) devoted to “Challenges and Opportunities of Global Business in the New Millennium: Contemporary Issues and Future Trends” will be held in Poznan, Poland from July 3rd through 7th, 2011 in cooperation with Poznan University of Economics and in partnership with a number of state, provincial, and local government departments. His Excellency Mr. Waldemar Pawlak, Deputy Prime Minister and Poland’s Minister of Economy, will be the opening speaker along with a number of other important dignitaries. Scholarly papers, panel/special session proposals, and case study exercises for presentation and subsequent publication in the refereed Congress Proceedings in book and CD form and in a number of scholarly journals are invited. Theoretical, conceptual, and empirical papers (using qualitative/historical and quantitative methodologies) are solicited. Manuscripts submitted must be complete papers, ready for blind review, to be considered for inclusion in the Congress proceedings. A work-in-progress may be reviewed and considered for presentation, even though not published in the Congress proceedings. In addition to sharing scholarship regarding global business issues, the Congress is designed to offer an excellent opportunity to meet colleagues from around the world and exchange information and ideas on a variety of global business topics. This is a great organization and a great venue. No visas are required for nationals of most countries. Any specific Congress related questions should be directed to Congress Program Co-chairs Dr. Erdener Kaynak at ek9@comcast.net or Dr. Ajay Manrai at manraia@udel.edu. I would be delighted to send a complete call for papers in PDF format and otherwise be of further assistance. William Evans, Ph.D., is a Professor in the Department of Telecommunication and Film at the University of Alabama. His research interests include content analysis, media audience measurement, and health and science communication. He currently serves on the editorial board of Science Communication (a peer-reviewed journal). He has been principal investigator, senior personnel, or lead contractor for dozens of sizable grants and contracts, mostly related to the role of media in public health and in community emergence preparedness. As Director of the Institute for Communication and Information Research at the University of Alabama, a position he held from 2004 to 2010, Dr. Evans served as college-wide research administrator, identifying grant opportunities, preparing grant applications, and monitoring research ethics compliance for a faculty of more than 40 tenured and tenure-track professors. Dr. Evans is a member of the Broadcast Education Association (BEA) and has participated in eight of the ten most recent BEA annual meetings. Stephen A. King earned his Ph.D. in Speech Communication at Indiana University in 1997 and currently is Professor of Communication Studies at Delta State University, located in Cleveland, Mississippi. King’s research program includes a long-term interest in rhetoric, intercultural communication and popular culture. His first book, Reggae, Rastafari, and the Rhetoric of Social Control, was published by the University Press of Mississippi in December 2002. King traces how Jamaica’s popular music evolved both lyrically and musically from 1959-1980. The study also examines how the Jamaican government and its surrogates attempted to control Jamaica’s popular music and the Rastafarian movement. King’s second book, I’m Feeling the Blues Right Now: Blues Tourism and the Mississippi Delta, will be published by the University Press of Mississippi in July 2011. Promotional efforts to market blues music rely heavily on blues myths and claims of authenticity, strategies that seek to satisfy the imaginations of blues tourists who travel to the Mississippi Delta to experience authenticity (and spend money) in the mythical “birthplace of the blues.” At the same time, efforts to obfuscate Mississippi’s past embody conscious efforts to privilege a sterilized historical narrative, a narrative that relies heavily on revisionist memory practices. For example, while promotional materials often highlight the Delta as the “home of the blues,” and spotlight the region’s rustic and “authentic” blues culture, there is, not surprisingly, precious little information on Mississippi’s depressing record of state-sponsored oppression of African Americans. King’s work has also been published in a variety of journals, including the Southern Communication Journal, Howard Journal of Communications, Popular Music and Society, and Caribbean Studies as well as in edited books such as The Resisting Muse: Popular Music and Social Protest (London: Ashgate Press, 2006) and the forthcoming Popular Music and Human Rights, Volume I (London: Ashgate Press). King is currently outlining an applied intercultural communication project that examines issues related to rhetoric and racial reconciliation.